On April 11, the Saudi regime was highlighted for its continued deployment of chemical weapons against civilians – backed by the US coalition. In the context of the Syria strike, a decades-old plot to overthrow the Syrian government through means of war was revealed after WikiLeaks drew attention to a declassified CIA document published in 1983. Where Saudi Arabia has an extensive history of human rights abuses and the US has an unwavering ability to turn a blind eye to the atrocities engaged in by the Saudis, the Assad regime – with unproven association to the recent chemical strikes – appears to be the target of a US military assault. A crime scene on an international scale that should have been investigated – to draw the appropriate conclusions – was very quickly decimated by Tomahawk missiles. What was left of the proposed storage space containing chemicals such as sarin, were utterly destroyed in fires and explosions instigated by the US military. This makes a conclusive investigation near on impossible to conduct. 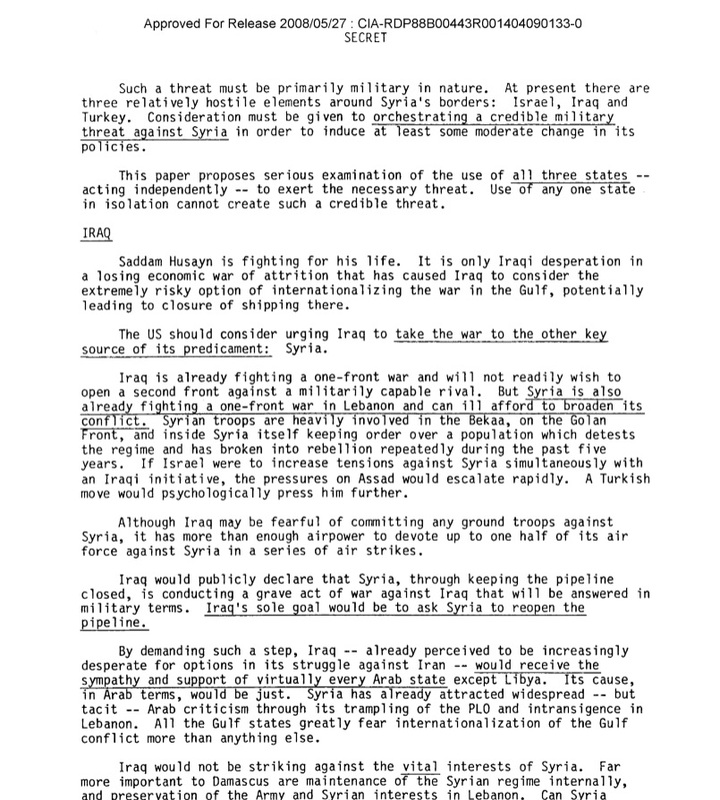 The 1983 CIA documents, written by former CIA officer Graham Fuller, highlight the ongoing attack against the Assad regime. 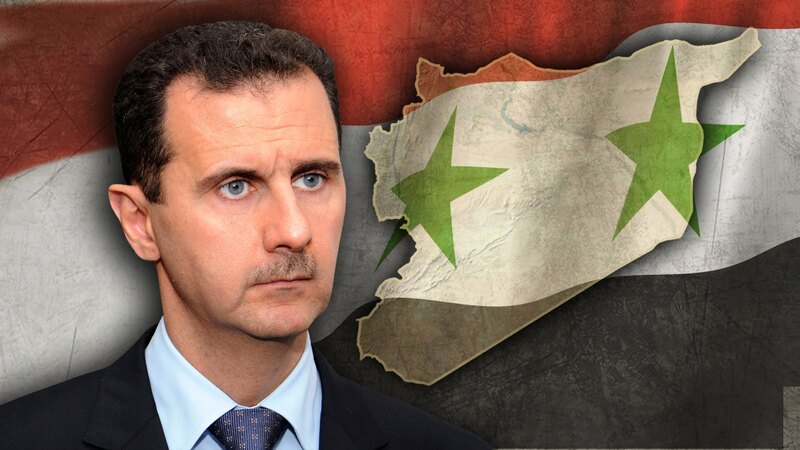 Starting in the 1970’s, when current Syrian President Bashir al-Assad’s father held office, the CIA examined plausible possibilities to overthrow the Syrian government. The CIA outlined possible allies – including Saddam Hussein and Iran – to help create Middle Eastern tensions in the name of geopolitical pipelines. From there, the document goes on to cover points on how to go about such an activity, and the benefits versus the consequences and possible responses from the nations they wished to participate in the conflict. The declassification of the document, titled Bringing Real Muscle to Bear Against Syria demonstrates the arrogance of a department(s) that are unbashful about the Devil’s details. For what has now been ongoing anti-Syrian propaganda for a little over 3 decades, the US appears to have finally won – at least – a small part of the battle. “Syria continues to maintain a hammerlock on two key U.S. interests in the Middle East. 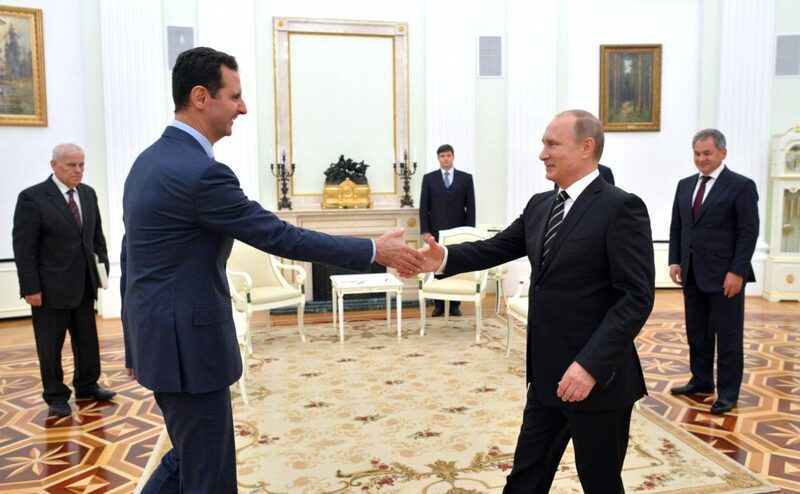 The document outlines how diplomatic efforts with the Assad regime drew very little result. And how the United States Empire ran out of patience. Only months after Fuller’s report, on October 23, 1983, a suicide truck containing explosives caused 241 US military personnel deaths at a Marine barracks at neutral Lebanon’s Beirut International Airport. A simultaneous attack occurred kilometers away, killing 58 French servicemen, and two weeks later an attack against the Israeli military headquarters in Tyre killed 60. Similarly, in the last weeks, chemical attacks were linked to Syria’s Assad without any investigation and based only on ‘belief.’ A public outcry followed the Mainstream Media’s hype despite the vehement denial from both Syria and Russia that the attack was not of Syrian government authorization. For Assad to authorize a chemical attack, the self-sabotaging act isn’t logical. To kill the small amount of people that died, Assad only needed to put boots-on-ground soldiers. It also begs the question why Assad would also carry out a chemical attack only days after Trump announced he’d leave Assad alone? Why risk US intervention? As the 1983 report demonstrates, the United States has had their sights set on Syria for more than 3 decades. In 2013, the UN stated enough evidence pointed to the Syrian rebels (US backed) for the chemical attack then. Evidence was destroyed this year before an investigation was conducted. The Pipeline politics continues unabated, and there is no reason to believe that the current situation is any different from the last historical accounts. 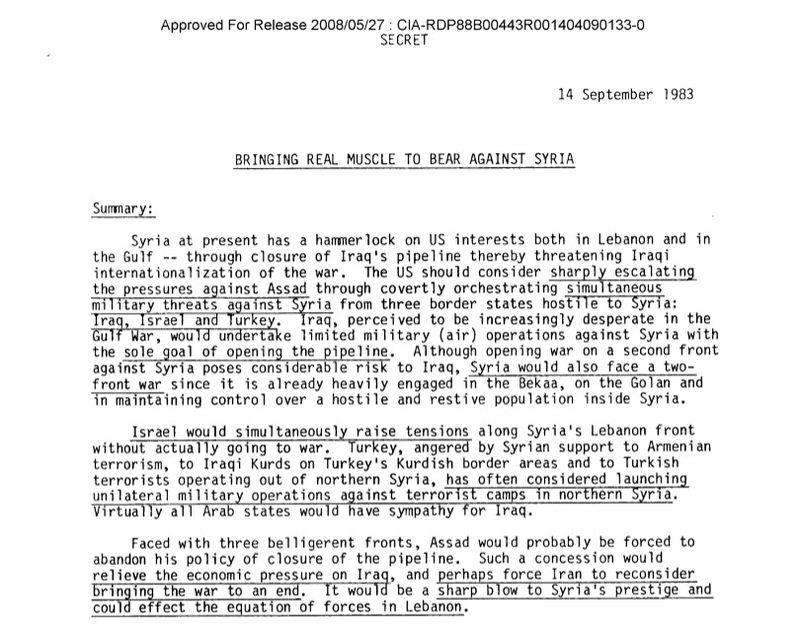 This article (Declassified CIA Document Reveals Pipelines the Real Reason Behind Destroying Syria) is a free and open source. You have permission to republish this article under a Creative Commons license with attribution to author Aral Bereux and DNewsHQ.